Certain cuisines are found virtually everywhere around the globe, Indian cuisine is one of those, with restaurants present from Britain to Russia to Canada. In an area like central New Jersey with such a prominent Indian population, it is obvious that Indian restaurants are ubiquitous. Princeton proper has five, with countless more on Route 1 from here to Edison. The only question, though, is how many of them will provide good food, as most of the Indian restaurants in Princeton are not particularly exciting. This, however, all changed with the arrival of Cross Culture, which provides delicious, aromatic Indian cuisine. 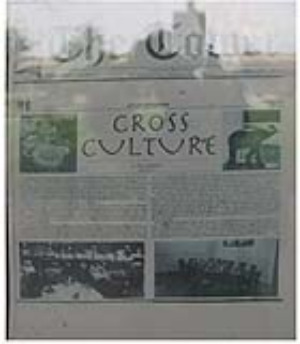 Located in the Shopping Center right behind A Taste of Mexico in the former Zen Palate locale, Cross Culture is the second establishment by the owners, who have a very successful Cross Culture restaurant in Doylestown, Pennsylvania. The restaurant’s location is quaint and pleasant, with a few Indian paintings on the wall and lots of light from windows all over. The Indian staff is friendly, enthusiastic, and knowledgeable. Of course, a restaurant is nothing without the food. Cross Culture offers a plethora of flavorful dishes hailing mostly from northern India. The dishes differ in terms of their levels of spice and range from stews, such as chicken tikka masala served in an orange sauce, to the tandoori plate, brought sizzling hot to the table. There are also seafood dishes, such as the exquisite shrimp karahi, prepared in a flavorful sauce of tomatoes and onions, and the traditional curry. About a third of the menu is vegetarian, with dishes such as palak paneer (spinach), baingan bharta (eggplant), and dal makhani (lentils). The naan breads are also delicious; there are plain breads as well as ones flavored with garlic, herbs, and others with spiced potatoes. 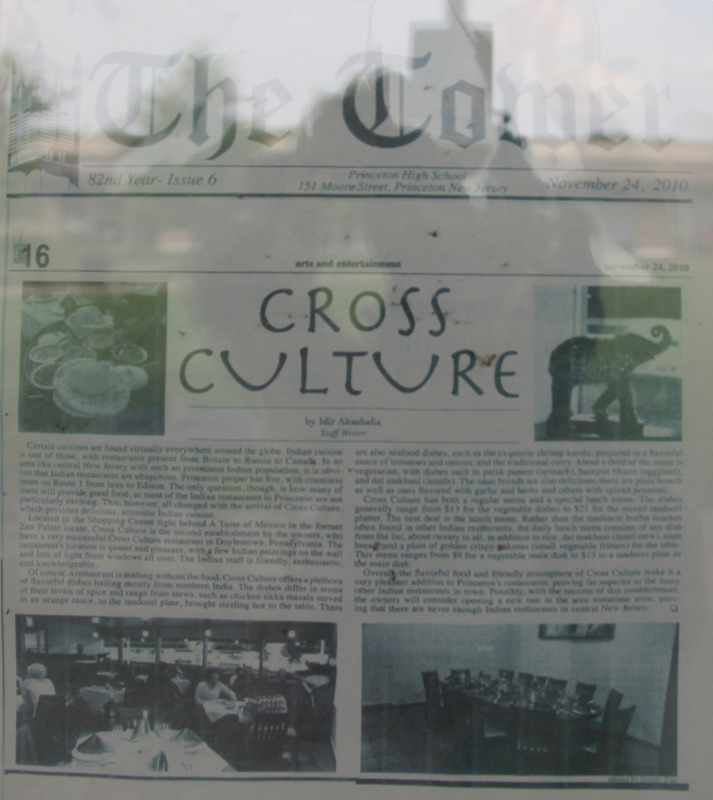 Cross Culture has both a regular menu and a special lunch menu. The dishes generally range from $13 for the vegetable dishes to $21 for the mixed tandoori platter. The best deal is the lunch menu. Rather than the mediocre buffet lunches often found in Indian restaurants, the daily lunch consists of any dish from the list, about twenty in all, in addition to rice, dal makhani (lentil stew), naan bread and a plate of golden crispy pakoras (small vegetable fritters) for the table. This menu ranges from $9 for a vegetable main dish to $15 to a tandoori plate as the main dish. Overall the flavorful food and friendly atmosphere of Cross Culture make it a very pleasant addition to Princeton’s restaurants, proving far superior to the many other Indian restaurants in town. Possibly, with the success of this establishment, the owners will consider opening a new one in the area sometime soon, proving that are never enough Indian restaurants in central New Jersey.